A Schottky diode is one type of electronic component, which is also known as a barrier diode. It is widely used in different applications like a mixer, in radio frequency applications, and as a rectifier in power applications. It’s a low voltage diode. The power drop is lower compared to the PN junction diodes. The Schottky diode is named after the scientist Schottky. It is also sometimes referred to as a hot carrier diode or hot electron diode and even a surface barrier diode. 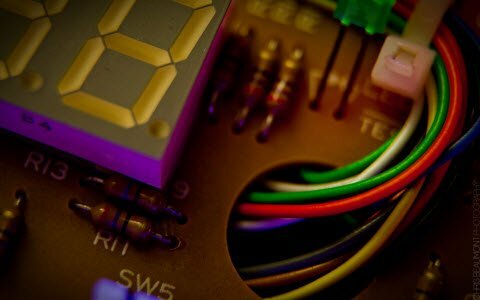 This article discusses about what is a Schottky diode, construction, applications, characteristics and advantages. A Schottky diode is also known as a hot carrier diode; it is a semiconductor diode with a very fast switching action, but a low forward voltage drop.When a current flows through the diode there is a small voltage drop across the diode terminals. In a normal diode, the voltage drop is between 0.6 to 1.7 volts, while in a Schottky diode the voltage drop normally ranges between 0.15 and 0.45volts. This lower voltage drop provides higher switching speed and better system efficiency. In Schottky diode, a semiconductor–metal junction is formed between a semiconductor and a metal, thus creating a Schottky barrier. 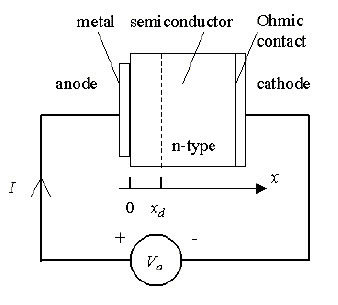 The N-type semiconductor acts as a cathode and the metal side acts as the anode of the diode. It is a unilateral junction. A metal semiconductor junction is formed at one end and another metal semiconductor contact is formed at the other end. It is an ideal Ohmic bidirectional contact with no potential existing between the metal and the semiconductor and it is non rectifying.The built in potential across the open circuited Schottky barrier diode characterizes the schottkey diode. Schottkey diode is a function of temperature dropping. It decreases and increasing temperature doping concentration in N type semiconductor. 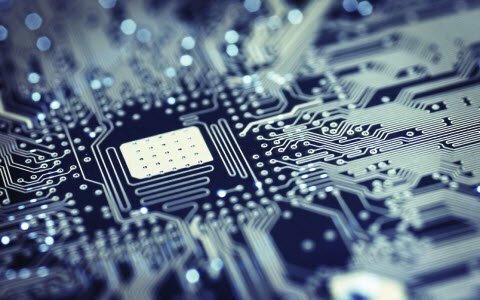 For manufacturing purpose, the metals of the Schottky barrier diode like molybdenum, platinum, chromium, tungsten Aluminium, gold, etc., are used and the semiconductor used is N type. The forward voltage drop of the Schottky barrier diode is very low compared to a normal PN junction diode. The forward voltage drop ranges from 0.3 volts to 0.5 volts. 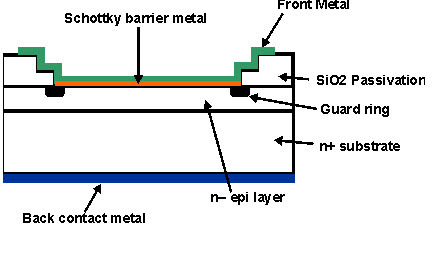 The forward voltage drop of Schottky barrier is made up of silicon. The forward voltage drop increases at the same time increasing the doping concentration of N type semiconductor. 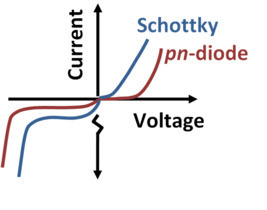 The V-I characteristics of a Schottky barrier diode are very steeper compared to the V-I characteristics of normal PN junction diode due to the high concentration of current carriers. Where IDiffusion is diffusion current due to concentration gradient and diffusion current densityJn=Dn*q*dn/dx for electrons, where Dn is the diffusion constant of electrons, q is electronic charge = 1.6*1019coulombs, dn/dx is a concentration gradient for electrons. ITunneling is the tunneling current due to quantum mechanical tunneling through the barrier.The probability of tunneling increases with the decrease in the barrier or built in potential and decrease in depletion layer width.This current is directly proportional to the probability of tunneling. IThermionic emission is a current due to thermionic emission current. 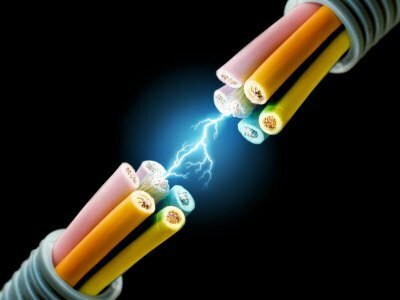 Due to thermal agitation, some carriers have equal energy to or larger than the conduction band energy to the metal-semiconductor interface, and to the current flow.This is known as thermionic emission current. Since the current flowing direction through the Schottky barrier diode is through majority charge carriers. Hence, it is suitable for high-speed switching applications because the forward voltage is very low and the reverse recovery time is very short. Schottky diodes are used for the voltage clamping applications and prevention of transistor saturation due to the high current density in the Schottky diode. It’s also be a low forward voltage drop in Schottky diode, it is wasted in less heat, making them an efficient choice for applications that are sensitive and very efficiency. Because of the Schottky diode used in stand alone photovoltaic systems in order to prevent batteries from discharging purpose for the solar panels at night as well as in grid connected systems, containing multiple strings are connected in parallel connection. Schottky diodes are also used as rectifiers in power supplies. 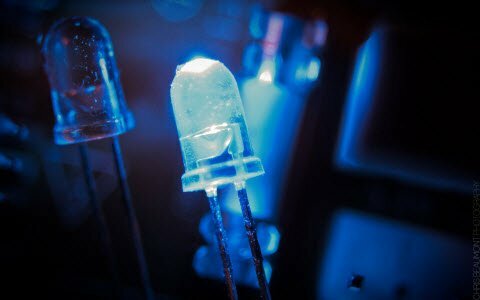 Schottky diodes are used in many applications compare to other types of diodes that do not perform well. Low turn on voltage: The turn on voltage for the diode is between 0.2 and 0.3 volts. For a silicon diode it is against 0.6 to 0.7 volts from a standard silicon diode. Fast recovery time: A fast recovery time means a small amount of stored charge that can be used for high speed switching applications. Low junction capacitance: It occupies a very small area, after the result obtained from wire point contact of the silicon. Since the capacitance levels are very small. 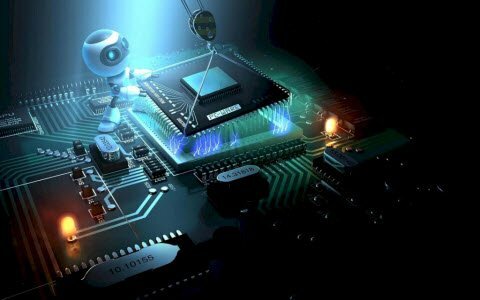 Thus, this is all about Schottky Diode Working and its working principle and applications. We hope that you have got a better understanding of this concept. 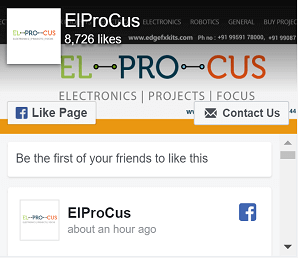 Furthermore, for any doubts regarding this article or electrical and electronic projects, please give your valuable suggestions in the comment section below. Here is a question for you, what is the main function of Schottky diode?